Be sure you realize that we have ISF calibrated picture settings for the UN50ES6100 using the included 10 point white balance adjustments. 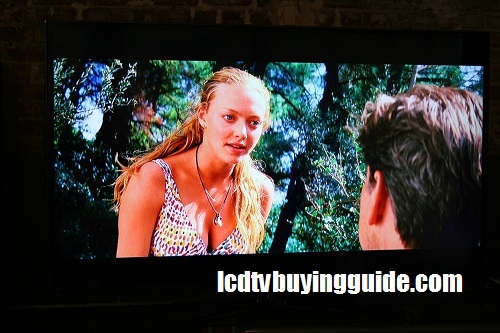 If follow them precicely you will see that the TV calibrates excellently well to D6500K. This will ultimately improve your viewing experience and eliminate the negative effects from features you do not need enabled. Don't worry, the menu system makes changing each color relatively easy. Our ratings are based on the TV after it has been calibrated. Black performance on the ES6100 is a strong point, blacks are dark and inky and show improvement over 2011 models. The most important thing is to keep the backlight at the right setting. Detail in dark scenes is the largest improvement. Dark scenes are an area where the black tends to be over powering in previous models. This one is equipped with a semi-matte screen instead of the Ultra Clear Screen we initially thought that the panel would have. So there is no Ultra Clear Screen technology. The result is poorer side viewing angle quality in this TV. All matte type LCD screen finishes diminish contrast and saturation at side viewing angles. The plus side is a reduction in reflection from the screen, but glare off the screen from in room light remains. TV calibrated perfectly to D6500K without a hitch. The resulting colors are quite accurate. Post calibration picture with all the “extras” disabled turned out to be a very nice. Post calibration contrast measured a stout 2505:1. The black bars top and bottom the picture show a saturated rich black (from anywhere near the front of the screen). This spec speaks to how well the TV processes fast action, and from what we could see when viewing the European Championships, the ES6100 did a very nice job of presenting the action. Viewing angles are going to suffer on any LED/LCD TV equipped with a matte or semi-matte screen finish. The ES6100 saw contrast/saturation diminished by around 20% at 25 to 30 degrees off center. This is not worse than others in this area, it may actually be a bit better. Front and center is going to yeild the best results from this TV. Dynamic: Too vivid, only used if you have tons of light coming in from outside and even then it's probably too bright. Standard: This is also the Energy Star option and it's also juiced with blue tones and still overhyped with color and the extra features that cause artifacts. Natural: Juiced, saturated and bright as do the others, but with a penetrating orange hue (even in flesh tones if you like people to look orange). Movie: The movie setting with Auto-Motion Plus turned off is pretty acceptable. With Auto Motion set to normal, there is considerable judder, motion artifacts, and elimination of too much natural background blur. Colors look pretty natural though and much better than the other 3 settting. There is no dedicated Game/Gaming mode. There are available Expert modes for calibrators through the service menu if necessary. One of the biggest differences feature-wise between the ES6100 and ES6500 is the 120hz as opposed to 240Hz in the latter. To my eyes, it does not make a big difference. It does help eliminate judder but there are visible side effects when watching film based content, so be ready change some settings. We recommend no matter what picture mode you watch, that you go into this setting in the Advanced Picture menu, tune the feature to Custom then turn the Blur Reduction to 10, and the Judder Reduction to 0. The judder reduction part of this feature works too hard and actually distorts the picture. The result eliminatines too much natural background blur. This accentuates the judder/jerky motion effects when the camera pans slowly, and creates motion artifacts. To get there: Go to the Picture Menu and scroll all the way down to Picture Options, click enter, scroll down to Auto Motion Plus, click enter, once there click enter again and scroll down to Custom, click enter, then make the adjustments to Blur and Judder Reduction. This option is located just below the Auto Motion Plus feature in the Picture Options menu. As far as we can see from testing this feature takes some color saturation away from the picture and dims the picture slightly. We could not see what kind of benefit this option offered. When there is fast moving images it may help slightly with judder and to smooth motion slightly. Same with MPEG or Digital Noise reduction. It was hard to find a benefit in them. Samsung's Smart Hub returns again this year for the UN50E6100. 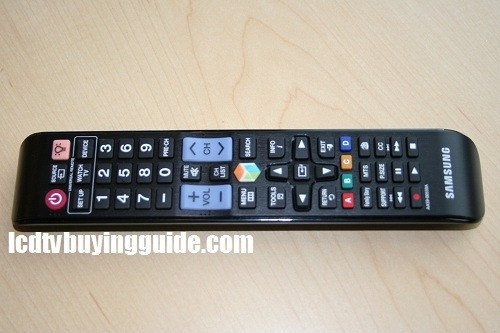 The interface is user friendly and buttons have been placed on the remote for quick access to the more popular features. Streaming video is supplied from the major premium providers like Netflix, Amazon Video-On-Demand, Hulu, VuDu and more. You also get access to the Samsung App store. Their app store now has more than 1500 Apps in 2012. The format will be instantly familiar to smartphone users who use similar app markets on their phones. There are apps for news, weather, sports and even games you can play on your television. Most of the apps are free, but paid apps run anywhere from $.99 to $9.99. Aside from that, the usual premium channels options are also incuded. There is a new Search All feature to allow you to find videos via Apps or other connected devices as well. Social media hookups like Facebook and Twitter are of course accounted for. You are likely to run into a few bumps along the road when accessing the Apps initially. We did, and we deal with all sorts of Smart TVs. After working it out the only negative we noticed was slow response times when loading and returning to Apps. This is most liekly due to limited memory. It can be a bit frustrating and make the experience less than memorable. Mtv Music Meter – Lists of musician/bands trending on the Internet. Click on one and the video plays. Listening to Bon Iver gave me another opportunity to test the speakers on the ES6100 – not bad, good guitar rendition for TV speakers. There are also tweets, photos, and news options aside from the videos. Rating 4 out of 5. Overall, Samsung still has far and away the best Internet Apps selection. Categories include: Videos, Most Popular, games, sports, lifestyle, information, education. The free content here is much better than other brands out there. The paid apps are a better value and come at a more reasonabe price. Premium Apps such as the movie services, sports and music are also top notch. The web browser in the ES6100 definately leaves a lot to be desired. I searched the term Google through the web browser and it gave me lots of options, scrolling to the bottom yielded the true web browser search through Bing's results. 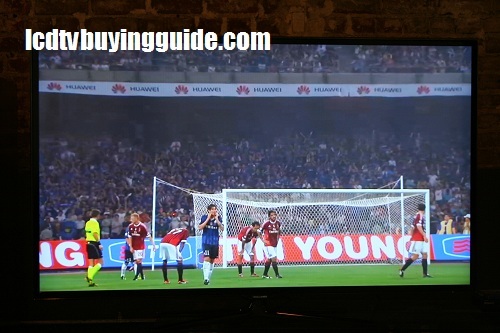 The arrow keys control the mouse and clicking on the browser tab brought up the full keyboard at which point I started typing 'lcdtvbuyingguide.com.' To say using the browser is like watching molasses drip does not capture how slow it is. Samsung does have the advantage though. At least it is a true Web Browser and not a proprietary deal that does not let you out into the open Internet (aka Sony HX750). When I got to the web site it loaded farily quick. It's not a feature you will use much due to it's laziness, but it is there if you are desperate. No QWERTY remote or Magic Remote (like the LG) is a bummer. The UN50ES6500 has a black matte .5” wide frame which is also black on the sides with an overlay panel running all the way to the metal frame sides. The disign is not going to blow your mind. It is fairly minimalistic with nothing much to complain about. The included black 4-legged quadrapod stand swivels left and right about 20 degrees. The front panel itself is a semi-matte finish so not as slick looking as those clear coat screens (such as LG Cinema Screen or Panasonic Plasma top units). The menu system is the same as the top tier Samsung TVs. The same goes for Smart Hub access. The remote is basic but complete, which will make many people happy. It assists with easy calibration and the small tutorials to the right of each setting are helpful. The menu is not transparent, but it's not too large either. You can still see a good bit of the picture while changing settings. One annoyance stems from a certain placement of the Exit key on the remote. It is located just below the right arrow key. 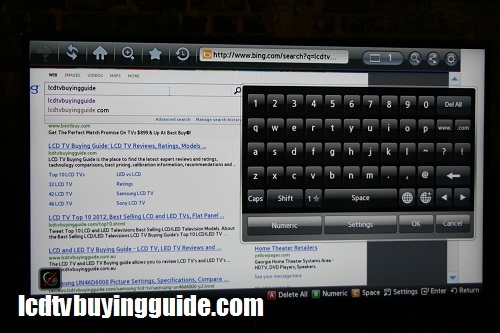 You may find yourself accidentally hitting the exit key when when navigating around the Smart TV Apps. Re-entering and re-locating may be something you get a little too familiar with. 3 HDMI inputs and 3 USB inputs head up a very complete load of inputs for connectivity. Skype is an available option through an optional camera that costs around $99. The Wifi setup seemed initially easy to set up but then caught a glitch and it took some time to get the TV connected. Nice sound feedback on everything. Audio function is a nice surprise on a 2” deep LED – most of that depth is to house the built in speakers on the bottom back of the TV. The sound quality is much improved over last year. I would put sound quality rating at around 7.5 out of 10. At $1000 the UN50ES6100 is priced $200 less than the 50ES6500. It stand out as a great value when features and specs are compared. They has almost the same features except for some specs like the Hz rating. Consider the robust Smart TV suite and this turns out to be a solid value. 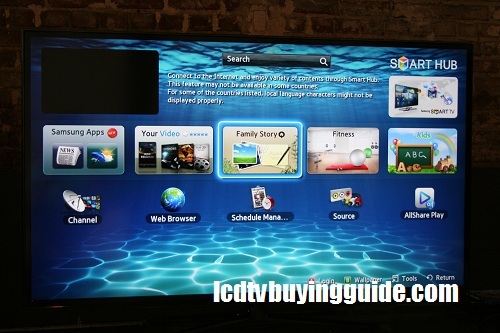 Competition is from the LG 55LM6700 and the Sony KDL-50EX645 and Toshiba 55L6200U and an assortment of plasma TVs.